Markers, or felt-tip pens, serve a variety of functions. Children use them to make bright, colorful drawings. The stereotypical teacher uses a glaring, unmistakable red felt-tip to grade papers. Retail employees, roadside vendors, performers, and protestors rely on the indelible, eye-catching shades and thick inking surface of these writing and drawing utensils to announce sales, prices, and productions, or to create strongly worded posterboard signs to convey dissatisfaction. Markers are also useful for permanently marking surfaces, which is often necessary for identification purposes—putting names on clothing tags, boxes, and tape which can be adhered to almost any item. The felt-tip pen was invented by Sidney Rosenthal in 1953. This inventor from Richmond Hill, New York, placed a felt tip on the end of a small, stout bottle of permanent ink and discovered that the resulting marks saturated a heavy, absorbent surface, yielding rich color and permanence. The felt-tip pen had many predecessors. Inks and dyes have been used throughout human evolution for marking objects, from cave writings fashioned from natural dyes of the earth applied with sticks to graffiti applied with paint from an aerosol can. Ink is a combination of a coloring agent, or pigment, and a liquid containing oils, resins, and chemical solvents. Initially, ink was fashioned from different colored juices and plant and animal extracts. Today, synthetic materials are used in addition to these natural substances. The use of ink for writing and printing dates back to 3,200 B.C. , when the Egyptians used a mixture of fine soot and vegetable gum to create a substance that could be used for writing and painting. Both Egyptians and Greeks used iron oxide (or, more commonly, rust) to make red ink. Around 2,000 B.C. , the Chinese began making red ink from mercury sulfate and black ink from iron sulfur mixed with sumac tree sap. Like the Egyptians, they formed their ink into a solid block or stick that would be mixed with water when used. Europeans did not begin commonly using ink until the seventeenth century, using tannic acid from tree bark and iron salt to create the recipe that formed the blue and black inks still used today. Like inks and dyes, pens have been used since antiquity. The earliest pens were made from hollow reeds and, later, hollow wing feathers of geese and swans, called quills, infused with ink. Steel pen nibs came into use in the early 1800s, and then fountain pens, which did not require a constant resupply of ink like previous incarnations, gained popularity. House paint also came into popular use in the late 1800s when Edwin Binney and Harold Smith used red oxide pigments (a mixture of naturally occurring dyes and chemicals) to create a viscous coloring substance—the paint that was used to color America's first classic red barns. Binney and Smith, through their company Binney & Smith, then created a line of carbon black pigments that were used by the Goodrich company to color its white auto tires black. and began fashioning slate culled from the area into pencils. From there, the company created dustless chalk in 1902. In 1903, the company fashioned a variant of its industrial wax marking crayons, which were smaller and came in a variety of colors created by colored pigments added to paraffin wax. Thus, Crayola crayons were born. By the late 1950s while Binney & Smith was expanding its crayon business, Rosenthal was building up his company, Speedry Chemical Products, which manufactured and marketed his felt-tip pen invention. Rosenthal initially geared his product at the art supplies market, but soon thought to capitalize on its mass market appeal due to its suitability to poster-making, sign-lettering, and other marking purposes. Competitors threw their hats in the ring as early as 1958, when Carter's, Inc., came out with a more slender marker with an aluminum ink tube. Speedry sued Carter's for patent infringement, but lost. Other companies began marketing pens containing water-soluble inks that could be used on normal-weight paper (Rosenthal's invention required heavier paper to keep the ink from soaking straight through to the underlying surface) and with capillary flow technology, which enhanced the movement of the ink into the tip of the writing utensil. When Rosenthal changed the name of his company to Magic Marker Corporation in 1966, he was already suffering the effects of this increased competition. Despite its name becoming synonymous with its product, regardless of the manufacturer, Magic Marker Corporation continued to lose money and filed for bankruptcy in 1980. In 1989, Binney & Smith, now a subsidiary of the Hallmark Corporation, purchased the rights to the Magic Marker name, stating that it was motivated to purchase the moniker due to remaining high consumer recognition of the brand name. The defunct Magic Marker Industries would be able to use the royalty income garnered from selling the use of its name to pay off creditors. Binney & Smith now manufacturers a wide variety of Crayola markers as well as Magic Markers. The marker body, cap, and plugs are formed from plastic resin. The marker reservoir, which holds the ink, is formed from polyester. Powder and water are used to form the felt writing tip. In addition, markers require ink, and the pigments and synthetic substances used to make it. Toluol and xylol used to be common synthetics used as solvents in dye, but due to their toxic nature these substances have largely been replaced with safer chemicals such as cyclic alkylene carbonates, although these chemicals are still used to make the indelible ink contained in permanent markers. The solvent is the substance into which the dye is diluted. Water also acts as a solvent in ink. Additives may also be used in an ink mixture to act as wetting agents. 1 The ink mixture is concocted. Preferable ratios are 1-10 % water by weight (the water content must be sufficient for complete dissolution or dispersion of the dye), with the remainder of the weight being made up of a solvent such as alkyl or alkylene carbonate. 2 Conventional additives, such as nonylphenylpolyglycol ether, alkylpoly-glycol ether, fatty acid polyglycol ester, or fatty alcohol ethoxalates, and preservatives, such as ortho-phenolphenyl and its sodium salt, ortho-hydroxydiphenyl, or 6-acetoxy-2,4-dimethhyl-m-dioxane, may also be added to the mixture. 3 To make the body of the marker, plastic resin is injection-molded into a marker body. Injection molding involves heating a substance, in this case plastic resin, into a molten state and forcing (injecting) it into a mold of the desired shape, then allowing it to cool and harden. Marker caps and plugs are formed in the same manner as the barrel. 4 The nib, or tip, of the marker is made from powder which is mixed with water, molded, and baked into its pointed or flat form. 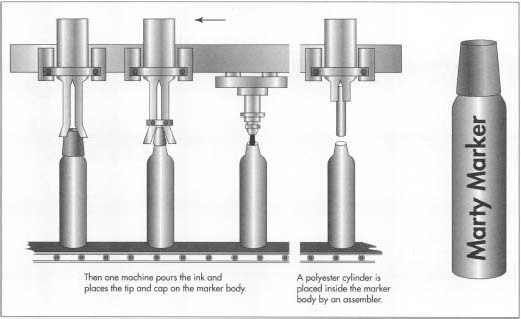 5 Using one machine for all the following functions, an assembler then places a polyester cylinder inside the marker barrel to form a reservoir for the ink, fills the reservoir with ink, and inserts the nib at the bottom and the cap at the top. 6 The markers are then placed into color assortment and packaged for retail marketing. While individual markers can be disposed of like any other household waste, special concern must be given to the disposal of excess ink by the manufacturer. Typically, ink disposal would not be subject to any stringent environmental regulations because it does not contain toxic substances, but there is a special disposal requirement. It is against federal regulations to discharge anything to a sewer system that will alter the color of the contents of that system. Thus, liquid ink cannot be dumped down a drain, but must be combined with an absorbent material and disposed of like a solid. Furthermore, if any of the contents of the ink exhibit certain characteristics, such as toxicity, that qualify those contents as a hazardous waste, the substance must be disposed of according to federal and state hazardous waste regulations. The traditional marker is continually being enhanced. Markers are available in both indelible and washable formulas. Markers are also produced that can yield changing colors, color over colors, emit scents, and be used to create three-dimensional drawings. One of the most popular spin-offs of the marker is the highlighting marker, which comes in a variety of translucent, fluorescent colors and can be used for marking text. This is a popular product with students and professionals. Ink companies are also at work developing products that are more environmentally sound, such as inks using vegetable oils or water instead of traditional petroleum or other solvent ingredients. Flint Ink Corporation. 1997. http://www.flintink.com/index2.html (July 14, 1997). "How are Crayola Markers Made?" Binney & Smith, Inc. 1996. http://www.crayola.com:80/manufacture/markers/home.html (July 14, 1997). U.S. Patent #4,931,093 (Marker or Felt Tip Pen) (from the Great Lakes Patent and Trade Center at the Detroit Public Library). I am collecting data for her to better understand the makings of all pens/crayons and ink mediums. So she can use which data she needs. I came by this site from my Yahoo searcher. Is it possible to make the body of the marker a product of wood,ceramic,metal or glass? If yes what is the process? If no,why?